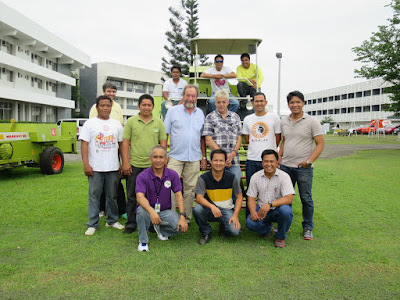 Tom Clemeno, fondly called Tom C, has served IRRI for more than 34 years. Tom Clemeno, agriculturist and former manager (1998-2010) of the Experiment Station (ES) of the International Rice Research Institute (IRRI), passed away at age 59 on 27 October 2015. Tom served at IRRI for more than 34 years in different capacities starting as a research aide in 1984. He worked his way up to senior manager of ES, where he served for almost twelve years. Finally, he served as senior consultant at the Plant Breeding, Genetics, and Biotechnology Division in late 2013. Known as a man with a big heart, Tom supported various projects and was very active in employees' welfare. He led former IRRI employees’ associations, and groups such as the IRRI Filipino Scientists Association (IFSA) and the Society of IRRI Non-research Professionals (SINOP). Tom, during the last days of his life, wrote a 14-page memoir The man they call Mr. Tom C, which was shared with family and friends during a funeral service held in his honor on 29 October 2015. He is survived by his wife Jovita, children Joanne Christianne, Timothy John, and Tom Justin, daughter-in-law May Lanuang, and granddaughter Louise Ysabelle. Tom's body was laid to rest on 30 October at Heaven’s Garden, Los Baños, Laguna. Tom was considered a fine leader and a dear friend to many in the institute, and will be greatly missed. Friends and former colleagues who would like to extend help and contribute financially to Tom’s family may do so through IRRI’s sectoral organizations. in a memoir titled The man they call Mr. Tom C.
Full memoir, shared with permission from the Clemeno family. Dr. Robert Zeigler, IRRI director general, Ms. Corinta Guerta, IRRI director for external relations, and Ms.Rose Dong-Chong Hsiou, deputy director general of the Department of International Affairs, Council of Agriculture, Taiwan discuss joint activities at the review and planning meeting for the new collaborative program on 27-29 October at IRRI Headquarters. 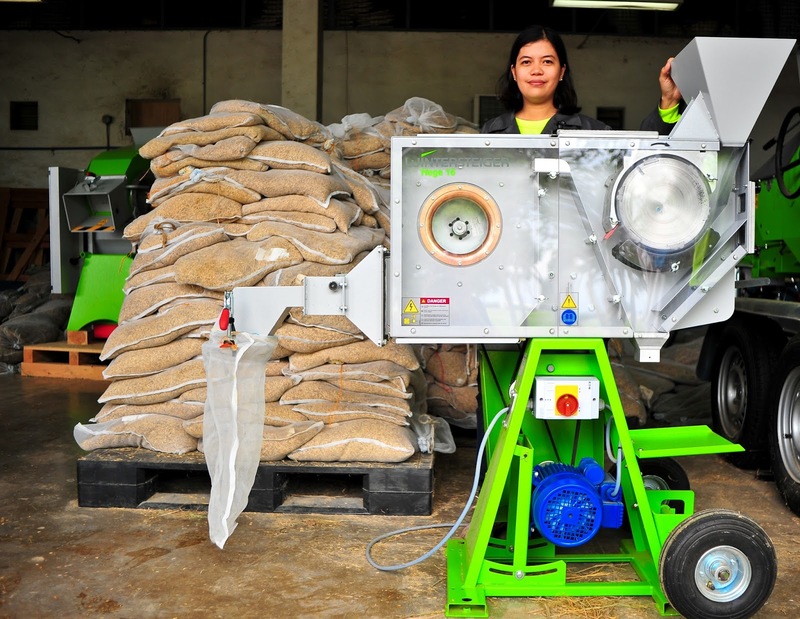 Taiwan and IRRI have never been short on agricultural innovation and reinvention. The development of Taichung Native 1 (TN1)—a high-yielding semidwarf indica variety—by the Taichung District Agricultural Improvement Station in 1949, is one of the significant events in the history of rice varietal improvement. The dwarfing genes found in Taiwanese semidwarf rice varieties were used by IRRI to develop modern rice varieties. Back in IRRI’s formative years, Dr. T.T. Chang became the institute’s first geneticist. From 1962 to 1991, Chang managed the International Rice Germplasm Center. His research on the evolution and variation of rice has led to major advances in plant breeding, productivity, and disease resistance, with a profound impact on agricultural productivity throughout much of Asia, Africa, and South America. The genebank was later named the T.T. Chang Genetic Resources Center in his honor. Dr. Paul C. Ma and Dr. Shen Tsung-Han also played instrumental roles in the launch of the institute. Other past collaborative activities have proven mutually beneficial among IRRI, the National Taiwan University (NTU), and the Taiwan Agricultural Research Institute, Council of Agriculture of the Executive Yuan. These led to the promotion of research, training, integrated pest management, and rice germplasm improvement and conservation, among others. In October 2008, IRRI and NTU signed an agreement establishing a partnership in rice research to boost global rice production. Now, a new chapter in IRRI’s partnership with Taiwan begins. Recently, Taiwan strengthened its commitment to global food security with an annual donation of USD 600,000 to support a collaborative program on rice research with IRRI from 2016 to 2019. This program was the result of a long-term dialogue between Taiwan and IRRI representatives Zeigler, Ms. Corinta Guerta (director for external relations), and Dr. Hei Leung (scientist and country representative to Taiwan). Leung recounted how the newly energized partnership with Taiwan began. “It started as an initiative in Taiwan to explore ways and means of developing climate-resilient crops 5 or 6 years ago,” said Leung. “As a consequence, we were invited to submit a research proposal.” The project was called Intensifying rice breeding technology to cope with climate change and increase rice self-sufficiency in Taiwan. It is the second phase of this project that the government of Taiwan, through the National Taiwan University, is currently funding. The meeting was attended by Ms. Rose Dong-Chong Hsiou, deputy director general of the Department of International Affairs, Council of Agriculture (COA), and Deputy Secretary General Lee Pai-Po of the International Cooperation and Development Fund (TaiwanICDF). Also part of the Taiwan delegation were Deputy Director General Hung-Hsi Lee, Department of Science and Technology; Dr. Chwen-Ming Yang, director of the Crop Science Division, Taiwan Agricultural Research Institute (TARI); Dr. Ming-Hsin Lai, Crop Science Division, TARI; Dr. Men-Chi Chang, Department of Agronomy, NTU; Ms. Chia-Yu Li, program manager, Technical Cooperation Department, TaiwanICDF; and Ms. Ming-Chuan Chung, specialist, Department of International Affairs, COA. In addition to the COA, TARI, and NTU, the new program also expands IRRI’s partnership to include TaiwanICDF. TaiwanICDF is dedicated to boosting socioeconomic development, enhancing human resources, and promoting economic relations with partner countries. “This is the first time we will be working with TaiwanICDF. The partnership will focus on capacity building and training on postharvest and seed production,” said Guerta. 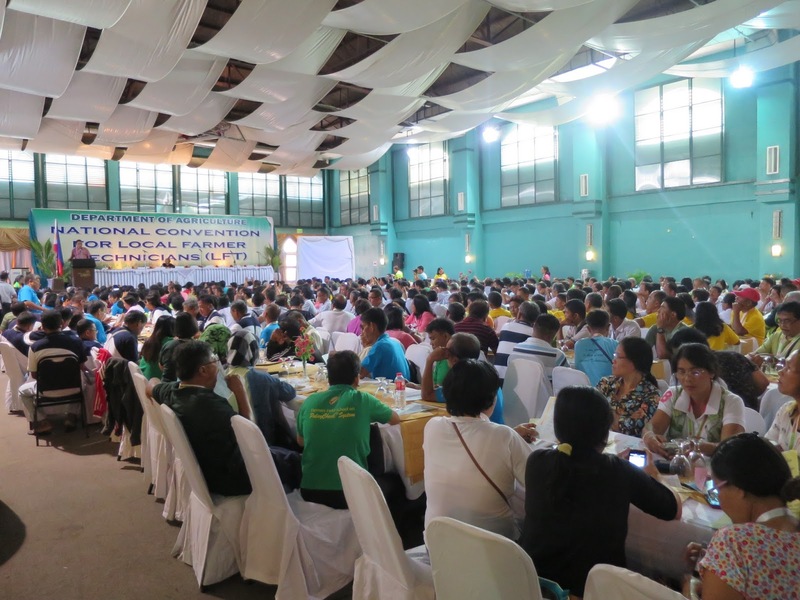 Farmer technicians, who play a big role as extension intermediaries, were introduced to different resources and tools in a recently concluded national convention for local farmer technicians (LFTs) at the Crown Regency Hotel, Lapu-Lapu City, Cebu, on 27-28 October 2015. One of the tools presented to more than 1,300 LFTs was the Rice Doctor, a diagnostic tool on crop problems, pests, and diseases. Jerome Barradas and Majilene Marikit of IRRI’s Training Center introduced the Rice Doctor and led a step-by-step discussion on how it is used, including its features. One of those presented was the “reporting feature”, which was part of the tool’s latest software update. The IRRI Rice Knowledge Bank, PhilRice’s Pinoy Rice Knowledge Bank, MOET App, Text Center, and the Rice Crop Manager were also presented during the two-day conference. 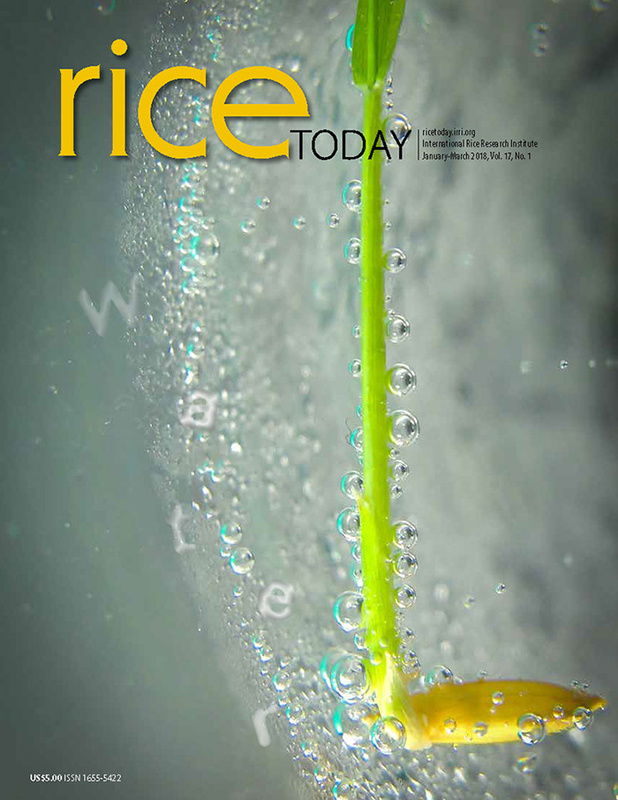 For more information on the Rice Doctor and other ICT materials, please send an e-mail to rkb@irri.org. Rice is the major staple food crop for Asians and supplies 50 to 80% of their daily caloric intake. However, rice is low in essential micronutrients such as iron, zinc or vitamin A in its polished form. IRRI has been developing healthier rice varieties that contain more iron, zinc, and beta carotene (a source of vitamin A) to help reduce hidden hunger. Russel Reinke, a rice breeder who focuses on developing rice varieties with high zinc and beta carotene, delivered a seminar Development of micronutrient-enriched rice for Asia at the University of Illinois Urbana-Champaign (UIUC). He discussed a potential solution to fighting hidden hunger with the introduction of Golden Rice and high-zinc rice. Graduate fellows under the Lee Foundation Rice Scholarships had the privilege to attend Dr. Reinke’s seminar. In his visit, Dr, Reinke met with his supervisee Nirmal Sharma (Bangladesh) and his colleagues Pradeepa Hirannaiah (India), Lenie Quiatchon-Baeza (Philippines), Hung Bui (Vietnam), Parthiban Thathapalli Prakash (India) and Sampurna Saikia (India). He also had a meeting with UIUC’s Assistant Professor Erik Sacks who co-supervises Mr. Sharma’s PhD research project in Crop Science. IRRI has always been committed to nurturing the environment for a new generation of rice extension professionals through technical knowledge coupled with practical competency. 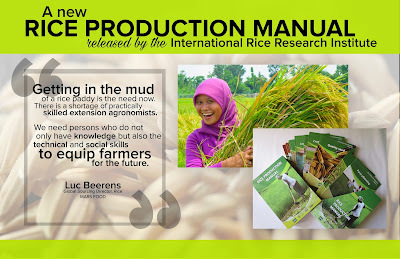 With this in mind, IRRI has developed the Rice Production Manual. This first edition has seven modules that contain a total of 25 lessons, which provides a framework and a guide for upgrading the knowledge and skills of field extension agents from national systems, the private sector, and civil society organizations. This publication is also intended to be a practical guide for daily use in field work and training not only of extension professionals, but also of young men and women farmers, young researchers, research technicians, rice practitioners, and students. Joe Rickman, senior engineer and agronomist, led the development of this manual, drawing from his extensive experience in Africa, Asia, and Australia. Wherever Joe has worked, he has given a high priority to practical training with sound technical and market understanding. Joe’s contributions have formed the bulk of the publication, whereas numerous others have added to sections or contributed to its editing and print design. More training manuals for field-oriented professionals are expected in the future, such as in-depth or advanced modules on postharvest, seed production and management, and so on. IRRI is already working on these practical guides to support competency for safe and skilled use of farm machinery. This is a practical series and is anticipated to be available for e-learning in the future. For more information, contact Jason Beebout through IRRITraining@irri.org. It is with deep sadness that the International Rice Research institute (IRRI) announces the passing of Dr. Benito S. Vergara, 81, on Saturday afternoon (24 October). Ben had been ill for some time. Born on 23 June 1934, Ben had a fruitful 38-year career at IRRI as associate plant physiologist (1 July 1961–31 December 1969); plant physiologist (1 January 1970–31 December 1983); head of the Agronomy, Physiology, and Agroecology Division (1 January 1984–30 November 1991); Director of Administration (1 December 1991–31 January 1996); and Consultant (1 February 1996–30 April 1998 and 1 September 1998–30 August 1999). Ben received his BS, MS, and PhD degrees, respectively, at the University of the Philippines (1955), University of Hawaii (1959), and University of Chicago (1960). Prior to joining IRRI in 1961, he was a physiologist at the University of the Philippines at Diliman. He is survived by his wife Lina, two sons, Sunny and Happy, a daughter, Joy, and four grandchildren. He married Lina Manalo at the guest house in IRRI staff housing on 22 September 1968. Lina was IRRI’s first head librarian and served in that post for 33 years (1961-92). Ben's IRRI publication A Farmer’s Primer on Growing Rice is a classic piece of agricultural literature (photo at left shows Ben going through the publication with a local farmer). 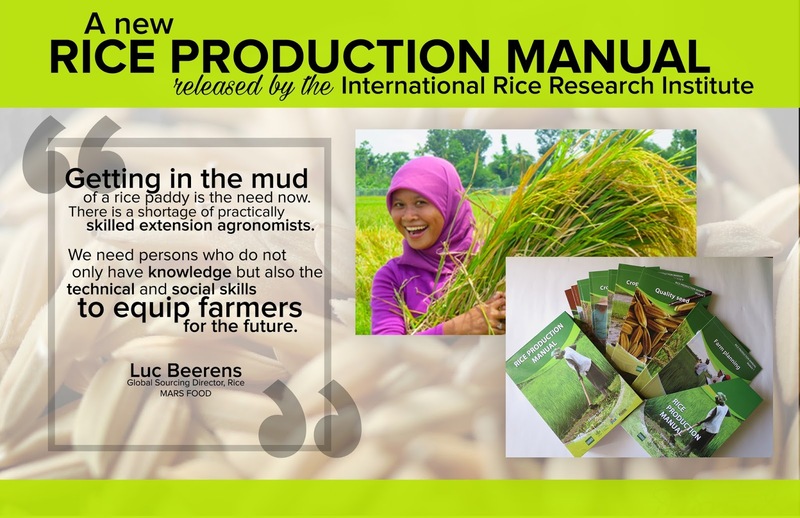 Since IRRI first distributed the unique guide in 1982, it has been published in over 50 languages and, to this day, is in use around the world among agriculturists, extension workers, and farmers. He published his last book in 2014. Church Among the Palms: Serving the Community, the Nation, and the World takes its readers on a journey spanning the church’s rich 100-year history. Ben received many awards over the years, including the Biology Teachers Association (BIOTA) Achievement Award (1980), Rizal Pro Patria Award (1980), Crop Science Society of the Philippines Award (1981), American Society of Agronomy Fellow (1986), Academician, National Academy of Science and Technology (1987), Gamma Sigma Delta Honor Society of Agriculture—Honorary Fellow (1993), and Outstanding Citizen of Los Baños (2004). Recently, Ben had embarked on selecting and breeding fruit trees of economic value. In collaboration with the Mama Sita Foundation, he had identified, bred, propagated, and promoted the Mama Sita Banana, the Luz calamansi, and the Mama Sita Macopa—all at his Los Baños farm. The wake was held at Arlington Sta. Mesa through 26 October 2015, and then later at Church Among the Palms, Los Baños, 27-28 October. IRRI had a memorial service at the Church Among the Palms on 27 October. A state funeral for Dr. Vergara, organized by the Department of Science and Technology/National Academy of Science and Technology, was held on Thursday, 29 October, followed by burial at the Heroes’ Cemetery (Libingan ng mga Bayani). Clarissa David, professor in the College of Mass Communication, University of the Philippines at Diliman, recently wrote an in-depth feature about Ben and his achievements that appeared in the International Journal of Philippine Science and Technology. Ben was treasurer of the Asia Rice Foundation. Donations may be made in his memory through the Asia Rice Foundation USA (ARFUSA). Los Baños, Philippines - The Board of Trustees of the International Rice Research Institute (IRRI) this afternoon concluded a packed three-day agenda, again fulfilling its mandate of setting the strategic direction of the institute and securing the future of its mission. IRRI chief Robert Zeigler said during the closing session that it was "an unbelievable honor to have known and worked with the board members through the years." This was Zeigler's 22nd, and last, board meeting after serving as director general and trustee for a full decade. Zeigler shared that the "invaluable guidance IRRI senior management receives from the board is something most people don't see. Proposals are very thoughtfully vetted... and without exception, the product is better for it." Board chair Emerlinda Roman reported to staff that IRRI's resource mobilization efforts will be brought into high gear to make up for significant reductions in funding to the CGIAR. She mentioned that, at the consortium level, changes in the governance structure will be implemented in 2016 and that a financing plan will seek to address funding shortfalls. Roman announced that the board's priorities in this challenging environment are to protect IRRI's core activities and science quality, and that adequate reserves are maintained. She also said that the trustees "were very pleased with the presentations during the program committee sessions and noted the excellence, dedication, and enthusiasm of the IRRI staff and the impact of the research they are doing." Roman officially announced the transition from Zeigler to incoming director general and current deputy director general for research Matthew Morell in December. The board also approved the development of a new ten-year strategic plan (2016-2025), which Morell will lead. Outgoing board members Robert Zeigler, P. Stephen Baenziger, Huqu Zhai, and Joyce Kikafunda were each acknowledged for their service and contribution to IRRI. Incoming trustees—Karen Moldenhauer, Bernadette Ndabinkunze, and Jiayang Li—were also announced. Akinori Noguchi, Tahlim Sudaryanto, and Suthad Setboonsarn have been reappointed to serve another six years on the board. In her farewell message, Kikafunda said that she had learned much during her six-year "tour of duty" and urged IRRI staff to continue doing great science. She then asked her youngest daughter to join her up on stage and announced that Blessing, now three-and-a-half years old, "is an IRRI baby." For the second time this year, the bi-annual Lakbay Palay, a field day featuring the latest technologies in rice production, was organized by the Philippine Rice Research Institute (PhilRice) at their Central Experiment Station in Muñoz, Nueva Ecija on 13-16 October 2015. The International Rice Research Institute (IRRI) took part, along with the DA-Agricultural Training Institute (DA-ATI) and various other agricultural seed companies. Booths were set up in which different ICT tools in rice farming were showcased for hundreds of farmers, agricultural technicians, and extension workers, who came mostly from municipalities of northern and central Luzon. Jerome Barradas and Lauro Atienza of IRRI’s Training Center served as resource persons for the IRRI Rice Knowledge Bank (RKB) and the Rice Doctor. An audiovisual presentation on the RKB was shown, which featured clips of farmers demonstrating how the RKB and other tools developed by IRRI helped them in their work. Demonstrations on the Rice Doctor were also conducted for farmers and extension workers. In conjunction with the Lakbay Palay, the AgRiDOC (agricultural development officers of the community) National Training of Trainers (NToT) was also held on the first of the four-day event. Twenty-five participants were trained on using different ICT-based tools used in rice farming, such as the IRRI RKB, the Pinoy RKB, the Rice Doctor, ATI’s e-extension services, PhilRice’s MOET app, IRRI’s Rice Crop Manager, and the farmers’ text centers. At the end of the training session, the participants were given computer tablets to use for agricultural training in the community, courtesy of the Improving Technology Promotion and Delivery (IPaD) project. The IPaD project, jointly led by PhilRice, ATI, and IRRI, aims to improve rice technology promotion and delivery by enhancing the capability of the next generation of extension professionals and other knowledge intermediaries. The first Lakbay Palay for 2015 was previously held on 14-15 April also at the PhilRice Central Experiment Station. IRRI Training Center's Lauro Atienza shows Lakbay Palay attendees how the Rice Doctor is used. The Taiwan government has strengthened its commitment to global food security with its recent annual donation of USD 600,000 to support a collaborative program on rice research with the International Rice Research Institute (IRRI) from 2016 to 2019. In an official letter addressed to IRRI Director General Robert Zeigler, Minister Bao-ji Chen informed IRRI that the Council of Agriculture (COA) will provide a budget of around USD 500,000 per year until 2019 to fund the rice varietal development program, and the International Cooperation Development Fund (ICDF) will support a customized capacity building program for enhanced extension services and global collaboration with a budget of USD 100,000 a year. Collaborative activities between Taiwan and IRRI are recent, but the country’s key contribution dates back to the development of IR8, also known as “miracle rice”. Through the agreement signed on 26 January 2015, IRRI formalized the strategic partnership with Taiwan in developing, evaluating, and disseminating new rice varieties. IRRI Deputy Director General for Communication and Partnerships, Bruce Tolentino, shares the significance of this collaboration. “Taiwan provided one of two parental lines of rice—Dee-geo-woo-gen—that was bred at IRRI to develop the first generation of high-yielding rice varieties, which sparked the first Green Revolution of the 1970s to 1980s,” he said. “Today, again in partnership with IRRI, Taiwan continues to help push the boundaries of science to ensure not only abundant, but also high-quality rice to ensure global food security and human health,” Dr. Tolentino added. Other past collaborative activities have proven mutually beneficial among IRRI, the National Taiwan University (NTU), and the Taiwan Agricultural Research Institute, Council of Agriculture of the Executive Yuan. These led to the promotion of research, training, integrated pest management, and rice germplasm improvement and conservation, among others. In October 2008, IRRI and NTU signed an agreement that established a partnership in rice research to boost global rice production. A recent research collaboration between Taiwan and IRRI centers on the need to jointly tackle the problems brought about by extreme climates. Plant pathologist and project coordinator Hei Leung expressed thanks for the financial support for this research endeavor. “IRRI is most grateful to the Taiwanese government for providing a new grant to support the discovery of new rice genes and traits that can tolerate the negative effects of climate change and to strengthen the collaboration between Taiwan institutions and IRRI. This will allow IRRI to fully explore the genetic treasures hidden in the International Rice Genebank, a legacy of world-renowned Taiwanese scientist, T.T. Chang, who pioneered its establishment in the 1960s,” he stated. COA is the authority on agriculture, forestry, fishery, animal husbandry, and food affairs in Taiwan. Representatives from the Council will be coming to IRRI to finalize the project workplan on 27-29 October 2015. Five brand new threshers are available at the IRRI Experiment Station. Check out the following types for your threshing needs! Thresh, de-awn, and clean without breakage, loss of seed, or mixing! The Hege 16 panicle thresher at the IRRI Experiment Station. 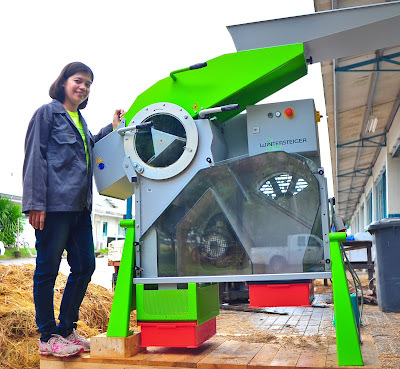 The LD 350 panicle thresher. Do it all in 2 minutes for up to 240 samples per day! Contact Princess Dela Cruz (p.delacruz@irri.org) or James Quilty (j.quilty@irri.org) for more information. The Institute strives to develop positive, productive and collaborative projects on education, livelihood and health and nutrition to serve our host communities beyond our rice research. Since 2005, IRRI provides livelihood training programs for women residing in Los Baños and Bay, the two host towns of the Institute. On its 10th year, IRRI Partnerships Office continuous its strong partnership with Ang-Hortaleza Foundation, Inc. (AHFI) in conducting Ganda Mo, Hanapbuhay Ko (GMHK), an annual 5-day livelihood training course. The project has since graduated 232 women on basic cosmetology course on hair styling and nail care. The PO partners with AHFI, which will provide beauty care training consultants and materials for the course. More than sixty women have registered for the livelihood program that will be held on 26-30 October. All participants will receive beauty starter kit from the AHFI to help get them started. The Republic of Union of Myanmar cited IRRI for its significant contribution and continuous support to sustainable food security and nutrition through Rice Sector Development in Myanmar. The award was conferred by the Honorable President of the Republic of Union of Myanmar, H.E. U Thein Sein at the Convocation Hall, Yezin Agricultural University (YAU), Nay Pyi Taw on 16 October. 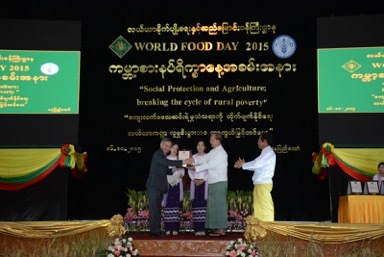 IRRI representative in Myanmar To Phuc Tuong received the award on behalf of IRRI Director General Robert Zeigler. In his message, Dr. Zeigler expressed his thanks to the Ministry of Agriculture and Irrigation for recognizing IRRI's contributions. The ceremony was held on World Food Day, a global movement committed o eradicating hunger in our lifetime. 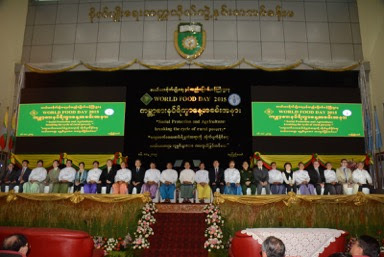 The World Food day event also showcased IRRI activities in Myanmar and Asia, including IRRI rice lines and newly released varieties in Myanmar. Doing WOGAM (water, oil, grease, air, and miscellaneous) check on the CLAAS Crop Tiger combine. The IRRI Training Center and Postharvest Unit conducted a three-day training course on Farm Machinery Safety and Operation for the mechanics, operators, and field supervisors of IRRI’s Experiment Station (ES) on 14-16 October 2015. 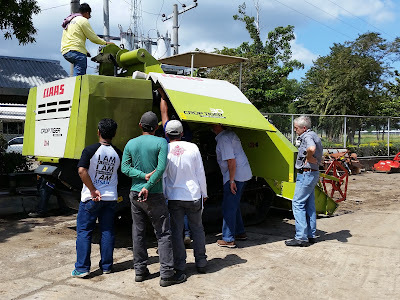 The training served to update the skills and knowledge of ES staff in the safe operation and maintenance of the machines being used in IRRI’s experimental fields and facilities. Joseph Rickman, mechanization and production systems specialist; Martin Gummert, head of the Postharvest Unit; and Carlito Balingbing, senior associate scientist, facilitated the training. “This program will instill good practice in maintenance and confidence in the operation of farm machinery at ES,” Rickman said. Nine ES staff, including the farm manager, field operations manager, supervisors, and technicians (operators and mechanics), attended the training course. On the first day, the trainees were asked to survey the different hazards and dangers across the ES that might impede safe and smooth machinery operations. Rickman emphasized the importance of having a safe environment and properly maintained equipment to reduce risk and improve efficiency. He also highlighted the importance of maintaining an accurate and comprehensive inventory of the status of all the equipment and machines, and keeping record of hazards, accidents, near misses, and machinery defects. Having regularly maintained equipment and well-oriented operators helps ensure that the mechanized field activities of the ES are efficient, effective, and safe. James Quilty, head of ES, is very supportive of this initiative and intends to include this training and certification program as an annual activity, with the aim of continuing to improve safety and efficiency standards. To successfully run this program, agricultural engineers from the Postharvest Unit will serve as evaluators in the accreditation of the technical and operation skills of ES equipment operators and mechanics. Martin Gummert also expressed his interest in this type of arrangement with the ES in order to keep staff members updated and well-versed on the mechanization program of IRRI. “This is the first step in developing training courses and in-house certification for operators of agricultural machinery at IRRI. We are planning to expand this basic course on safety, operation, and maintenance of tractors and combine harvesters, and develop additional training modules on tractor implements and field operation. These courses can then also be adapted for our country programs to supplement training already provided by our NARES partners,” Gummert concluded. World Food Day is a day of action against hunger. Every year, on October 16, people around the world come together to declare their commitment to eradicate hunger in our lifetime. In the lead-up to this international event, the annual winner of the World Food Prize is feted in Des Moines, Iowa. Sir Fazle Hasan Abed, the founder of Brac, the largest non-governmental organisation on the planet, has been awarded the 2015 World Food prize for his “unparalleled work on reducing poverty in Bangladesh and 10 other countries. 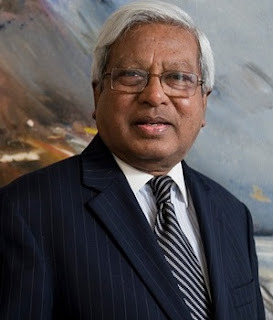 Sir Fazle received the Prize at a ceremony held earlier this week at the Iowa State Capitol in Des Moines. The event was the centerpiece of a three-day international symposium entitled the Borlaug Dialogue, which drew more than 1,200 people from 65 countries to discuss cutting-edge issues in global food security. IRRI and the World Food Prize have a historic bond. Read about nine other WFP laureates with IRRI connections in Gene Hettel's October IRRI History blog. The members of the Board of Trustees (BOT) of the International Rice Research Institute (IRRI) will gather at IRRI headquarters on 21-23 October for their regular meeting. On their agenda are several major topics, including the transition in directors-general. Robert Zeigler will complete his second and final term as DG in mid-December 2015. Matthew Morell, currently IRRI’s deputy director general for research, has been selected by the Board as the incoming DG, effective mid-December 2015. Emerlinda R. Roman, former President of the University of the Philippines. The board meets twice a year to review IRRI's research priorities, its allocation of resources, and to set the institute's scientific direction and decide on supporting policies and strategies. The Experiment Station (ES) at the IRRI Headquarters is undertaking stricter measures for safer farm and machinery operations after completing its risk analysis with the Risk Management Quality Assurance (RMQA) unit. The five teams under ES--BioEnvironment, field operations, mechshop and warehouse, crop pesticides applicators, and rice mill and crop production--participated in identifying occupational risks, the severity of each, and corresponding steps for mitigation. Four machinery operators and two members of the ES management team are now certified through a Philippine Department of Agriculture and TESDA program. In addition, all ES staff have completed first aid training with IRRI’s Safety and Security Services. ES has acquired new safety equipment, including a radio transmitter, which provides coverage across the farm, and a protective safety barrier for the combine harvester. The machinery operation certification program, developed collaboratively between the Training Center (TC), ES, and Postharvest started on 14 October. All equipment operators and mechanics are expected to complete this ongoing program before the end of the year. This certification program will be held annually and evaluated and updated on a regular basis. The integrated pest management and agro-chemical safety training and certification program is designed for the crop production team responsible for pest and disease management. The program was developed in collaboration with TC and will start in November. The team is also undergoing training on pest and disease identification and management with the CESD entomology and plant pathology groups. “IRRI is part of UPLB, UPLB is part of IRRI” said UPLB Chancellor Fernando Sanchez during the groundbreaking of IRRI's new plant growth facility a few months ago. His words have captured the essence of the long-standing collaboration between the two institutions. For more than five decades, the UPLB and IRRI partnership has contributed significantly to Philippine development, and beyond, through advances in agricultural science. Last October 10, IRRI participated in the annual celebration of UPLB’s 97th Loyalty Day with Agro-Industrial Innovations and Entrepreneurship for Inclusive Growth as this year’s theme. In line with the theme, IRRI showcased the Rice Research and Development Component of the Food Staples Sufficiency Program, which it implements with the Department of Agriculture. One of the highlights of the event is the traditional parade of students and alumni, members of different organizations, and employees from different offices in and around the University. Ho Chi Minh City, Vietnam, 14 October 2015 – With increasing challenges in agriculture and 2015 in particular being a difficult year for farmers in ASEAN, rice farmers need access to technologies to help them increase yields and efficiency. 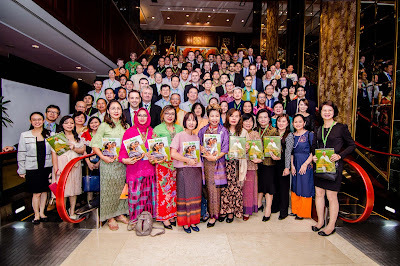 From October 14 to 16, over 100 policymakers and rice experts from across ASEAN countries are gathering at the ASEAN Rice Future Forum in Vietnam to discuss how public-private and value chain partnerships are essential to the adoption of farming technologies, in light of the fact that the majority of rice farmers in these countries are smallholders. The Forum is organized by Bayer CropScience, in partnership with the International Rice Research Institute (IRRI) and the Vietnam Ministry of Agricultural and Rural Development (MARD). It aims to continue the constructive dialogue from the 2013 Rice Future Forum in India and the International Rice Congress 2014 in Thailand. Casting the spotlight on ASEAN this year, where rice is the key crop grown by mostly smallholder farmers, the conference includes keynote addresses and panel discussions on several pertinent and relevant topics, including the need for capacity building and efficiency in sustainable rice production, the adoption and access to technologies and innovations in rice farming, and the need for closer collaboration throughout the rice value chain as well as more private-public partnerships. Rice is a key crop and a staple in most diets in ASEAN, with ASEAN countries accounting for 25 per cent of the global rice production, and 22 per cent of the global rice consumption. Thailand and Vietnam are the key exporting countries for rice in the region, accounting for nearly 50 per cent of global rice exports, while on the other end of the spectrum, countries like Indonesia and Philippines are striving for self-sufficiency in rice production and are the top rice importers in the region. According to estimates by the United Nations, the world will grow to 9.7 billion people by the year 2050. In addition, due to a rising middle class and a shift in dietary preferences especially in emerging countries, the projected nearly 10 billion people could eat as much food as required for an astounding 13 billion. IRRI projects that the current rice production—at over 700 million tonnes per annum—will not be sufficient to meet demand. Rice production will need to rise by 80 million tonnes in the next 10 years. With increasing challenges faced in agriculture and rice farming, including limited arable land, impact of climate change, labour shortage and limited resources, this growth must be achieved in a sustainable manner through harnessing innovative solutions and farming technologies. “Agriculture is exposed to a plentitude of challenges such as limited arable land and natural resources, a shortage or rising cost of labor, increased market volatility, limits to credit availability for smallholder farmers, resistance issues and an ongoing quest for further increasing sustainability – to name only a few,” said Dr. Sascha Israel, Head Region Asia Pacific, Bayer CropScience. “We have made some headways in the area of public-private and value chain partnerships in rice and have started seeing positive results from the projects that we are undertaking. Going forward, we believe we can continue to contribute to the development of rice farming in ASEAN through continuing and strengthening these partnerships, with a focus on enhancing the adoption of technologies by smallholder farmers,” he added. Stressing the importance of collaboration between the public and private sectors and across the rice value chain, the ASEAN Rice Future Forum this year is organized in partnership with the International Rice Research Institute (IRRI) and Vietnam’s Ministry of Agriculture and Rural Development (MARD). The event also features prominent speakers from companies and associations such as the IRRI-led Global Rice Science Partnership (GRiSP), the Deutsche Gesellschaft für Internationale Zusammenarbeit (GIZ), the Better Rice Initiative Asia (BRIA), as well as government officials and policymakers from Malaysia, Indonesia, Philippines and Thailand. For example, Bayer CropScience has a long-standing partnership with IRRI to work together to expand the rice database and provide the impetus for breeding new high-yielding rice varieties, as well as enabling access to the many benefits of hybrid rice for farmers and rice communities. Bayer is a global enterprise with core competencies in the fields of health care, agriculture and high-tech materials. Bayer CropScience, the subgroup of Bayer AG responsible for the agricultural business, has annual sales of EUR 9,494 million (2014) and is one of the world’s leading innovative crop science companies in the areas of seeds, crop protection and non-agricultural pest control. 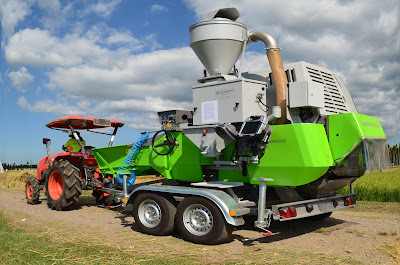 The company offers an outstanding range of products including high value seeds, innovative crop protection solutions based on chemical and biological modes of action as well as an extensive service backup for modern, sustainable agriculture. In the area of non-agricultural applications, Bayer CropScience has a broad portfolio of products and services to control pests from home and garden to forestry applications. The company has a global workforce of 23,100 and is represented in more than 120 countries. This and further news is available at: www.bayercropscience.com. IRRI, or the International Rice Research Institute, is a nonprofit independent research and training organization. IRRI is a member of the CGIAR Consortium. IRRI develops new rice varieties and rice crop management techniques that help rice farmers improve the yield and quality of their rice in an environmentally sustainable way. It works with public and private sector partners in national agricultural research and extension systems in major rice-growing countries to do research, training, and knowledge transfer. Its social and economic research also informs governments to help them formulate policy to improve the equitable supply of rice. The Ministry of Agriculture and Rural Development (MARD) is a government ministry responsible for rural development and the governance, promotion and nurturing of agriculture and the agricultural industry in Vietnam. The purview of the Ministry includes forestry, aquaculture, irrigation and the salt industry; it is also involved in water management and flood control. The Ministry maintains 63 provincial department offices throughout Vietnam, and is itself located in Hanoi. In an effort to further implement the rice research agenda of the country, the Royal Thai Government through the Rice Department recently approved annual donation of THB 3,600,000 (equivalent of USD 100,000) starting fiscal year 2014-2015 to the International Rice Research Institute (IRRI). In a letter addressed to the Thai Rice Department Director General Anan Suwannarat, IRRI Director General Robert Zeigler acknowledged the funding contribution. “We once again take this time to convey our deep gratitude to the Royal Thai Government for its support of IRRI and its mission,” Zeigler stated. The funding donation will greatly support the collaboration between IRRI and the Thai Rice Department toward achieving the goals set forth in the country's research agenda. IRRI Deputy Director for Communication and Partnerships Bruce Tolentino explains the goals of this collaboration. “As Thailand faces more complex and more serious challenges in this modern era, the country's policymakers are adjusting their domestic policies to strengthen the competitiveness of Thai rice in the face of growing competition from major producers such as Vietnam and India, and from newer competitors such as Myanmar,” he said. “The impacts of climate change will become more serious over the long term. Thailand must also raise farm yields, which requires the rapid strengthening of the national agriculture R&D system to ensure the availability of technology adapted to Thailand and readily accepted by Thai farmers,” Tolentino added. Since its collaboration in 1960 when IRRI was established, Thailand has been a staunch supporter of institute’s research. Key achievements of this partnership include improvements in deepwater rice culture and development of new rice varieties that can tolerate flood and drought. IRRI and Thailand have been working together to improve rice production and enhance capacities of Thai rice researchers. In October 2014, the 4th International Rice Congress (IRC2014)—the largest regular conference and exhibition of the global rice scientific research community and industry—was held in Bangkok under the patronage of the Royal Government of Thailand, specifically the Ministry of Agriculture and Cooperatives. Thailand hosted, co-organized, and provided financial support for IRC2014. The country was chosen as the location for the congress as it is a key player in world rice trade. Dubbed the “Olympics of rice science,” IRC2014 gathered around 1,500 participants from 69 countries. The event highlighted the latest in rice research to ensure global food security. With 16 partner countries, IRRI now explores partnerships with many nations to meet their specific local needs where traditional donor agencies lag behind in carrying out research activities. Collaborative funding arrangements between IRRI and countries, such as India, the Philippines, and now, Thailand, helps these nations become not only beneficiaries but partners of their own research initiatives.